Mary Fisher co-founded the Toronto School for Strings with her husband Julian in 1999. She has taught cello for over twenty five years, and brings a wealth of experience, instructing at all levels of cello, from young beginners to gifted young people, and to adults. Mary has extensive pedagogical training in the Suzuki Method, and is equally versed in traditional teaching approaches. Many of her students have gone on to careers as teachers and performers, as well achieving numerous awards in music festivals, Silver Medals in Royal Conservatory Examinations, and successful auditions to arts-based High Schools. Mary studied cello performance at the University of Manitoba, and taught for ten years at the Royal Conservatory of Music. She is an active adjudicator and a member of the RCM College of Examiners. 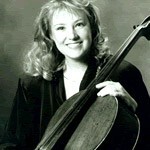 She studied cello with Dr. Tanya Carey, and taken courses with Irene Sharp, Hans Jorgen Jensen, and Carey Beth Hockett. Mary is an an active performer with the Fisher Quartet, has recently been Principal Cello of the North York Concert Orchestra, and freelances in a variety of ensembles in Toronto. As Artistic Director of the Toronto School for Strings, she develops programming, organizes events and outreach opportunities.